Italian painter and draughtsman. In 1528 Lanino was apprenticed to Baldassarre de Cadighis of Abbiategrasso in Vercelli, but from 1530 he was associated with Gaudenzio Ferrari, then the most important painter in Vercelli. Lomazzo claimed that Lanino was Gaudenzio s pupil. 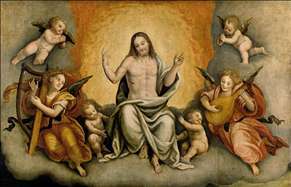 By 18 November 1533 he was already a master painter. His early works, such as the Virgin and Child with Saints (Turin, Galleria Sabauda), painted for S Eusebio, Ternengo, show how he had assimilated Gaudenzio s delicate effects, and interpreted them in soft, misty brushstrokes. After Gaudenzio moved to Lombardy (c. 1534) and later established himself in Milan (c. 1539-46), Lanino became the most active painter in the region; from this period date the Virgin and Child with Saints (1539), painted for SS Pietro e Paolo, Borgosesia (in situ), and Virgin and Child with Saints (1543; London, National Gallery), painted for Francesco Strata s chapel in S Paolo, Vercelli. Other altarpieces of this date include the Assumption of the Virgin (signed and dated 1543; Biella, S Sebastiano) and frescoes of scenes from the Life of the Virgin in Novara Cathedral (1546-53). 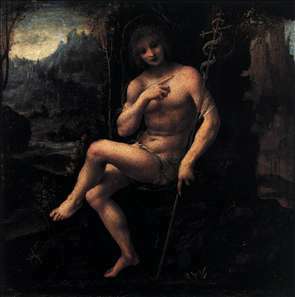 Between 1540 and 1560, Lanino made several visits to Milan, creating altarpieces and frescoes. There he absorbed the strong influence of Leonardo da Vinci s chiaroscuro. During this period Lanino made many of his finest drawings, creating startling chiaroscuro effects using black chalk and white bodycolor heightening on brown prepared paper. He often used pen and wash with white highlights in his accomplished compositional studies. Throughout the 1560s and 1570s, patrons eagerly sought Lanino s paintings, and his workshop was amazingly prolific. Examples of his soft style spread throughout the eastern Piedmont and Milan, and his sons also became painters in Vercelli. See more details about "St John the Baptist in the Wilderness"
See more details about "Triumph of Christ with Angels and Cherubs"